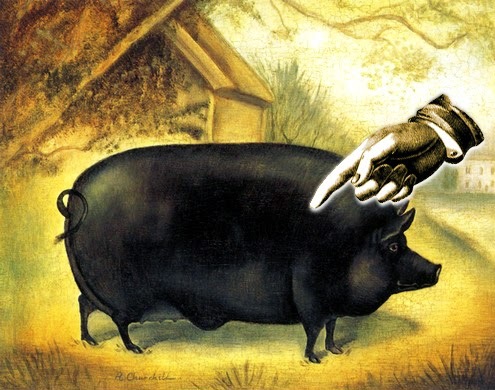 Everyone point at the pig's shoulder. February was dead. Initially I had two bookings for the first weekend and then my Saturday cancelled. Well, no, she didn't. I chased her up on the Tuesday to tell her we should really be discussing the menu only to learn that: oh, they couldn't make it now. I'd held that bloody booking for four months. This didn't help my mood. I don't like not cooking. So I decided to braise a shoulder of pork. This was partly because Etien keeps insisting we should open a pulled pork stall and make our fortune. He does love a porky bap does Et. He makes a delicious 'kim chee' coleslaw to accompany the meat. This isn't anything like the real fermented Korean delicacy but it's inspired by those flavours. And he's right, it works really well with luscious, slippery shreds of pork belly or shoulder - the lime juice acidity and the smokey sesame oil. We might take a stall at the next Palmers Green festival. Porky's Porkies is our current favourite branding. We'll see. You'll be the first to know. The other reason was because I'm catering a party for a friend's father soon. He's eighty and they're expecting in excess of forty guests. I wanted to see how far a shoulder went. Belly famously isn't lean, which can deter some eaters, me included. I've never been a fan of fat. My father was. He used to reach over and scoff up all the bits of bacon rind, yellow lamb fat and even gristle that I'd piled up on the side of my plate. Ew. I ordered a shoulder of orchard fed pig from Jim in F. Norman, on the parade in Oakwood. I'm using them more and more. Don't tell my other butcher; it's like having an affair. Belinda picked it up for me on Friday afternoon. I was expecting, indeed my recipe stated, a 3-5 pound joint. What arrived weighed thirteen and a bit; basically a stone of pork. "We'll need to invite some friends around." Because when I'm not cooking in the restaurant of a weekend, that's what I like to do: cook for friends. No, I'm not being facetious. We invited a dozen people, friends, exes, liggers and a few social climbers we just can't shake off. We expected half to already have plans; the way middle class people always do. (I don't. I never have plans.) But none did. Coupled with kids and family, my weekend was fast turning into a pulled pork party. And yeah, double entendres on a postcard please. Et made his coleslaw, although not nearly enough (my fault). I severely underestimated how much people would like it. Bread from Holtwhites of course. Sadly not my custom semi-brioche buns, these were simple floury, quotidian baps but still excellent of course. I also made some hummus/hummous/hoummmous and flamed a few plum tomatoes. Pulled pork. And this is after everyone had eaten. The massive locusts are in fact pieces of fat crackling. Slightly over done. This is what happens when I drink and drive an oven. Belinda doing what she does best. Wonder why they're all so red faced? But it wasn't going to be eating that night. A stone of shoulder needs a low and slow approach. Initially 90°C and then 120°C to crisp the skin - sixteen hours in total. It starts off as a roast but covered, in a large Dutch oven it soon becomes a braise. By Saturday evening it really was falling off the bones. I simply lifted them out, along with any large chunks of fat - not an onerous task. I also sliced the skin off to crisp properly in a 240°C fan oven. I shredded the meat into the copious roasting juices and then stirred in some barbecue sauce. Etien took exception to this. Next time he wants a simple fennel seed and salt roast. Neighbours chat while Ken keeps a keen eye on the pork. especially if they eat the last bun. Yes, next time. But when time? Not soon. There's a lot of meat on a large shoulder. After fifteen people ate their fill we still had half left. There then followed a week of porky wonder. Porky sandwiches, porky salad, porky pizza topping, filled porky pitta pockets, porky pasta with a creamy mushroom sauce. Ten days on and there's still a fistful lurking in Tupperware. I fear that'll be binned. Altogether that one £34 joint served up at least 35 meals and that's not even including those who had seconds at the original evening. Seems like a good deal. Mind, I have no idea what sixteen hours of oven costs. Dessert was a 'sort of' crumble. I made double the salty, almond biscuit base of my cheesecake and sprinkled it over cherries, blueberries and plums that had been fast poached in a spiced syrup. I made a mental note to eat more plums. They are delicate, beautiful and almost floral in flavour. This was served with an absurd mass of vanilla mascarpone that resembled a Desperate Dan mound of mash - sans sausage thankfully, we were all replete with pig by then. Dessert. I'd put a weird colour in the lights which makes this look like we're partying in the 1970s. February was dead but March and April are fast filling up - as is May and June. I was going to say so no more loaves and fishes moments but I've just heard from a farmer friend of mine (Peter in Cambridgeshire) who's been offered some slow grown, grass fed, English Longhorn beef. Among the best money can buy. But... he can only purchase whole animals. Did I want some?